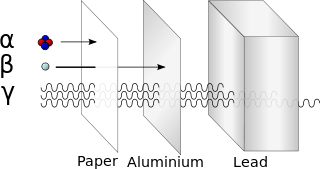 In physics, radiation is a process in which energetic particles or energetic waves travel through a medium or space. Two types of radiation are commonly differentiated in the way they interact with normal chemical matter: ionizing andnon-ionizing radiation. The word radiation is often colloquially used in reference to ionizing radiation (i.e., radiation having sufficient energy to ionize an atom), but the term radiation may correctly also refer to non-ionizing radiation (e.g., radio waves, heat or visible light). The particles or waves radiate (i.e., travel outward in all directions) from a source. This aspect leads to a system of measurements and physical units that are applicable to all types of radiation. Both ionizing and non-ionizing radiation can be harmful to organisms and can result in changes to the natural environment. In general, however, ionizing radiation is far more harmful to living organisms per unit of energy deposited than non-ionizing radiation, since the ions that are produced by ionizing radiation, even at low radiation powers, have the potential to cause DNA damage. By contrast, most non-ionizing radiation is harmful to organisms only in proportion to the thermal energy deposited, and is conventionally considered harmless at low powers which do not produce significant temperature rise. Ultraviolet radiation in some aspects occupies a middle ground, in having some features of both ionizing and non-ionizing radiation. Although nearly all of the ultraviolet spectrum of radiation is non-ionizing, at the same time ultraviolet radiation does far more damage to many molecules in biological systems than is accounted for by heating effects (an example is sunburn). These properties derive from ultraviolet's power to alter chemical bonds, even without having quite enough energy to ionize atoms. The question of harm to biological systems due to low-power ionizing and non-ionization radiation is not settled. Controversy continues about possible non-heating effects of low-power non-ionizing radiation, such as non-heating microwave and radio wave exposure. Non-ionizing radiation is usually considered to have no completely safe lower limit, although at some energy levels, new exposures do not add appreciably to background radiation. The evidence that small amounts of some types of ionizing radiation might confer a net health benefit in some situations is called radiation hormesis.